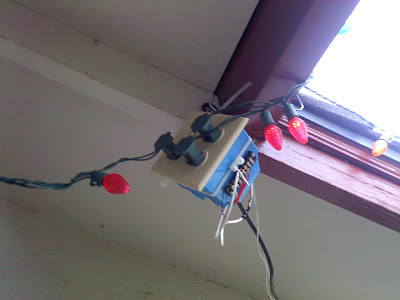 It's not anything particularly impressive in the automatic Christmas light control category, but this is what I put up for the holidays. It isn't much more than an Arduino and the TRIAC switch box out of my lamp control system. The TRIACs are hung under the eves, with bell wire run into the garage where I have the Arduino board on an outlet timer. It appears that the system is missing pull-down resistors on the TRIACs, since one of the channels leaks when the Arduino shuts down, glowing very dimly all day. It never ended up being a problem, but since my TRIAC circuit is clearly wrong, I won't post it.